I am suffering from type-2 diabetes and am new to insulin. I am from India and would like to know if 40IU or 100 IU is better for dose and why? I would be very thankful to you people to guide me. Actually, the first line of treatment for type 2 diabetes is by some natural steps. However, if you fail in these ways to beat diabetes naturally, then it comes to oral drugs. In your case, you're using insulin, that means you have not succeed in the above steps. It's a pity, however you must follow the dosage of insulin your doctor prescribed to you. "DO NOT USE INSULIN BY YOUR OWN!!!" Always consult your doctor, because he/she knows your health condition much better than me and may have noticed something that I am not aware of. For the dosage, it depends on your blood sugar levels and severity of the symptoms of type 2 diabetes you might experiencing. Thus, cannot tell you which dose is better for you. QUESTION: I am a 55 year old female from South Africa (of Indian decent). Was diagnosed as Type 2 +/- 5 years ago. On tablet medication to control my diabetes. Now I'm having problems with leg cramps. Would going onto Insulin help with the legs cramps. It is bad that you are experiencing leg cramps, which supposedly could be a complication of diabetes. - Diabetes and related arterial disease. - Other metabolic conditions, such as hypothyroidism, Addison's disease, cirrhosis, chronic kidney failure, alcoholism. - Muscle fatigue, dehydration, diarrhea, etc. As you are 55 years old, I am sure you are experiencing signs of menopause. Are you taking medicines for that? In certain cases, oral contraception drugs are given to women at your age. That would also be a cause of your leg cramps. Please understand that I am asking all these things to make you think over and try to help you finding out the right culprit of your leg cramps other than diabetes. Next, you are supposing that perhaps your oral medications for diabetes are causing leg cramps and you want to shift to insulin. To my opinion, if the meds you are taking are helping you to control your sugar levels, then, I do not think it is a good idea to shift to insulin. However, if your doctor is judging that you must shift to insulin, then try to do what she/he says as they know your medical condition better than me. 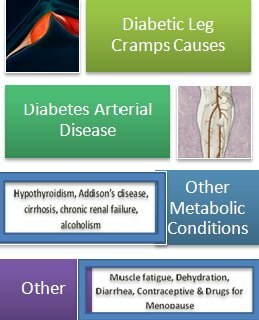 At the end, I want you to take into account menopause as this condition is also affecting your glucose metabolism. Therefore, the treatment and steps you should take are based on this condition too. Lifestyle changes, the right diet strategy and using certain herbs will not only optimize your glucose level; but also help with other health problems you might have.